If you’re saying your vows in Thailand, it’s likely that you’ll want to make the most of the great outdoors during the celebrations. There are plenty of ways to decorate the areas to be used for the ceremony and party and make them look and feel extra special. The chance to host your entire wedding celebration beneath blue skies and swaying palms is something that entices many brides and grooms-to-be to Thailand. Couples can easily make the most of the sunning tropical beauty when it comes to planning their special day – particularly those tying the knot in one of the Kingdom’s luxury private villas. While hotels and other venues might be strict about what kind of décor can be incorporated, couples saying “I do” within one of Thailand’s lavish have the freedom to create a decorative scheme that truly reflects their personal tastes. If you’re looking for some inspiration, below are some ideas on how to jazz up your villa’s garden to create your very own wedding wonderland. 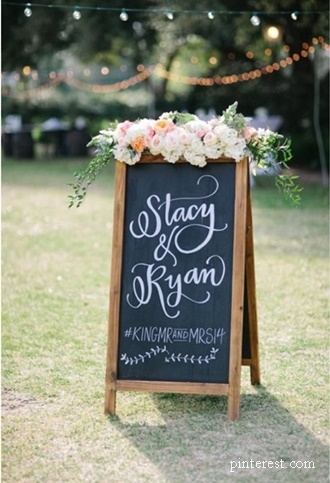 If you and your loved one are keen to create a rustic, vintage effect, then your wedding celebration should not be without its very own hand-drawn chalkboard. As well as serving a decorative purpose, your chalkboard could also serve a practical purpose such as directing guests in the direction of the bar or bathroom. If you have any little ones coming to the wedding, you could even get them to write the sign out. While the writing you end up with may be a little wobbly, this kind of chalkboard will add an adorable family flourish to your big day. Building up your own photo collage wall is a really great way to create a focal point on your wedding day – somewhere for guests to congregate and chat. Family photographs – perhaps the groom’s first time on a bike or the bride’s first holiday to the sea – will also provide a great ice breaker for guests to chat about if they’ve not met before. 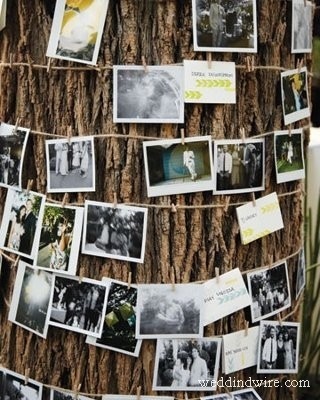 This bride and groom chose to embrace the outdoor setting by tying their collage round a large tree with bits of string, but you could easily assemble your own makeshift wall out of wooden planks to pin up your favourite family snaps for guests to admire. 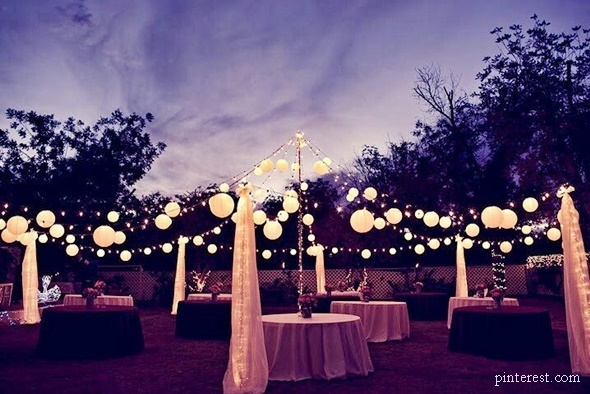 As well as providing a soft, magical golden glow of light once the sun has set, paper lanterns can also provide plenty of visual allure during the day as well. For starters, the colours you choose can co-ordinate with your overall decorative theme, giving your wedding album plenty of vivid hues in the background. Different sized and shaped lanterns will also give you decorative theme extra wow factor. If you’re hosting your celebration in a private villa, lanterns can be hung from the branches of trees to create a beautiful, fairy tale atmosphere as they sway about in the sea breeze. With the likes of Facebook, Instagram and Twitter offering up so many photo opps, your outdoor wedding wouldn’t be complete without a pre-made photo backdrop for guests to pose in front of. These bride and groom have opted to use adorable strings of flowers suspended from trees for a simple but gorgeous overall effect. From a distance, each individual bloom looks like it’s floating! 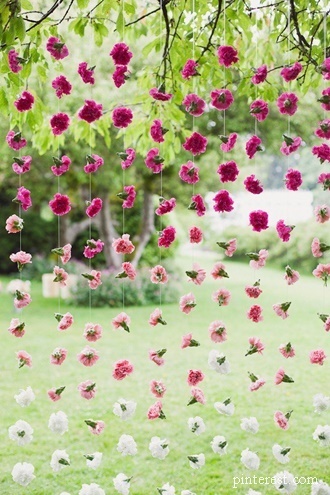 If you’re not so keen on flowers, then why not use paper pompoms, natural greenery, balloons or even twinkling fairy lights to create your own photo wall. If you’re planning for guests to congregate in the garden with canapés and drinks after the ceremony, you’ll need to make sure there are plenty of places for them to sit and relax. Why not provide a supply of cushions and blankets? 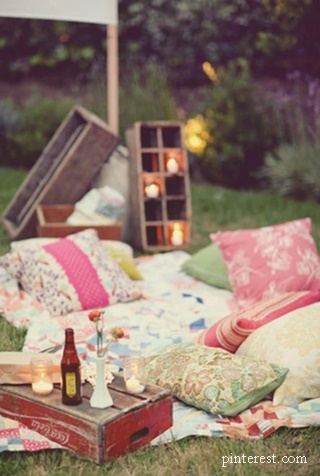 Colourful, knitted designs will be perfect for rustic weddings, and blankets spread out on the grass for guests to sit on will work well if you’re trying to create a relaxed, informal feel.